Now, I don't want to be scaremonger. It would be boring standing about in a field all day. Really, you just need to be sensible in the garden. 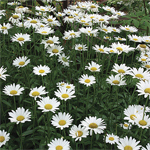 But it's us kids which are most at danger so I feel it's my duty, as Blogger-in-Chief, to pass on some of the things I learnt and mention a few of the plants which you might have in your garden which could pose a risk. 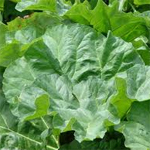 Rhubarb leaves - now as you know I am quite partial to rhubarb stalks, especially when it's made into yummy Rhubarb & Ginger Chutney by Auntie A. However, make sure you avoid the leaves as they are poy-zin-us! Daphne - a pretty name and a very pretty plant but eating even a handful of the berries can cause burning of the mouth and can even lead to death! 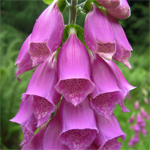 Digitalis (Foxglove) - the pretty foxgloves is a common sight in gardens and in the wild but eating this plant can cause nausea, diarrhea and even heart problems! Hydrangea - super popular in gardens, especially with my grandma, but don't confuse the flouncy flowers with candly floss. They will give you a sore tummy, make you dizzy and can even lead to a coma. 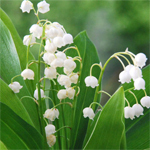 Convallaria majalis (Lily-of-the-valley) - these are pretty little flowers but you don't want to eat lots of them or you will get a sore mouth, nausea or cramps. Narcissus (Daffodil) - you see these everywhere in the Springtime but did you know what the bulbs are a bit poisonous? Don't try eating them or you will get a sore tummy and be sick. Polygonatum (Solomon’s seal) - we have these in our garden and they were munched to bits by the sawfly larvae. Clearly they are hardier than us humans as all parts are poisonous apart from the root and young shoots. The berries are most poisonous. 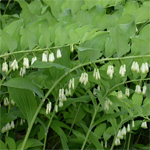 Despite this polygonatum is a medicinal herb! Taxus (Yew) - one of the most deadly trees in the world. Yikes! Most parts of the tree are poisonous and the leaves remain toxic even after they have wilted. Beware! 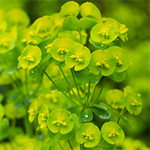 Euphorbia (Spurge) - this has a milky sap which you must avoid getting on your skin. Alstroemeria (Peruvian lily) - again this has a sap which can cause irritation. Don't eat it either as it can be poisonous. Purely for looking at it's prettiness only! Chrysanthemum - these can be a bit poisonous to eat and also avoid touching the flower heads as they can make you a bit sore and itchy and puff up a bit. Heracleum mantegazzianum (Giant Hogweed) *this one is super dangerous and MUST be avoided*. It can cause really bad burns to the skin. If you find it in your garden make sure an adult who knows what they are doing removes it quickly and report any you find in public places. 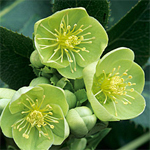 Helleborus (Christmas Rose) - another common garden plant (we have several in our garden) but again, take care, as it can cause skin irritation or an allergic reaction. Tulipa (Tulip) - tulips contain a substance called tulipalin which can cause skin irritation so just be careful if you have them in the garden. 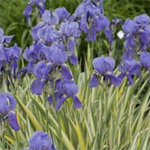 Iris - irises can cause skin irritation if touched. It's usually mild but take care. So, whilst being out in the garden is my FAVOURITE thing to do and I would always recommend you spend as much time out there as possible, just be careful. 1. We went to Northumberland on holiday which I hugely recommend for you to take your grown-ups to on holiday. There is lots for everyone to do. My favourite beach was Bamburgh beach, it's lovely! 2. I would also class boys as a skin irritant but I don't know the Latin name for a boy yet to list it here!